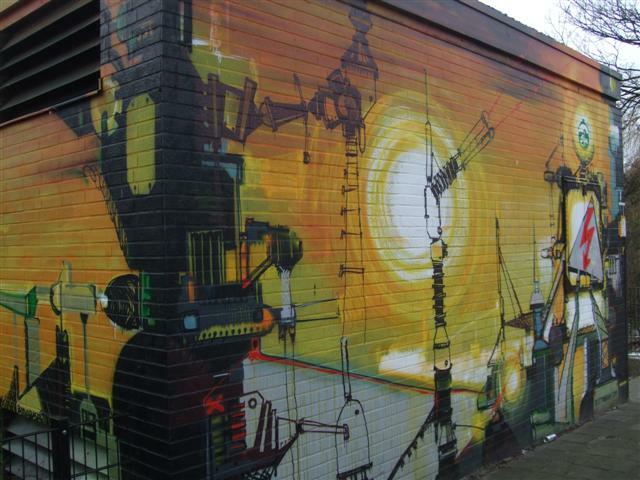 In recent years the City Council took it upon themselves to commission a beautification programme for the city’s Electrical Substations. (Finally doing something that brings a smile to my face with the tax Euro’s I give them LOL). 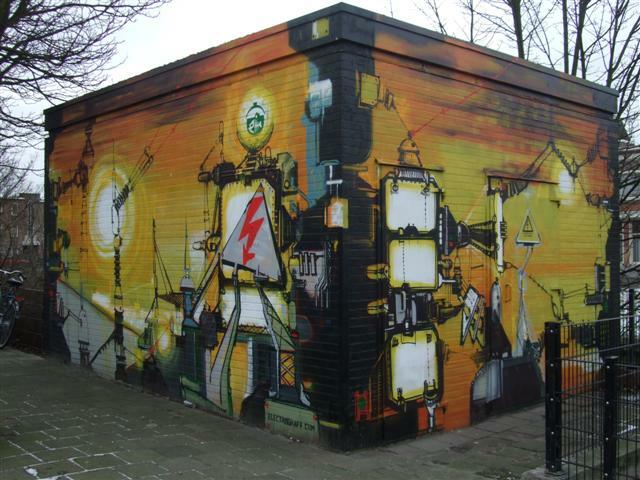 Gemeente Den Haag (The Hague City Council) commissioned artists to paint up Electricity substations around the Hague, and since I loved seeing the results, I resolved to try and find and photograph as many of them as I could. 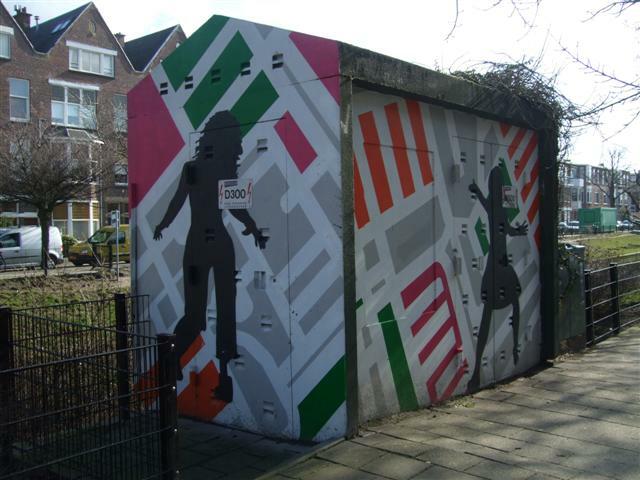 Therefore this post is part of an on-going series, featuring the artwork of Electrical Substations in The Hague. 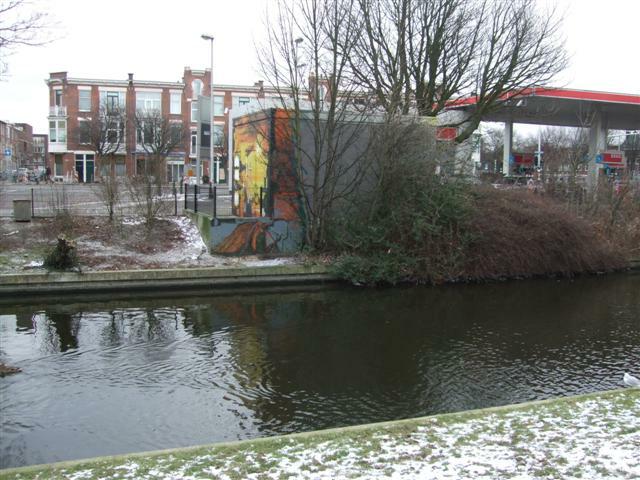 Today’s substation stands on the side of a canal, at the intersection of The Laan Van Meerdervoort and the Valkenboskade, not quite on the corner but a very short distance down, heading in the direction of the Ligusterstraat. If you look closely at the first photo, Does anyone else get the impression that the right side of the figure was drawn by a different artist than the left? The hands are as mis-matched a pair as I have ever seen and do my eyes deceive me or is she wearing a boot on one foot and does she have a peg-leg ? …or is there a more rational explanation? ..like, Does she have one very skinny leg and the other one is in a plaster cast ? (Yes, naturally enough I have plaster casts on the brain at the moment.. and maybe my lack of mobility IS driving me a little stir crazy and I’ve started to hallucinate). 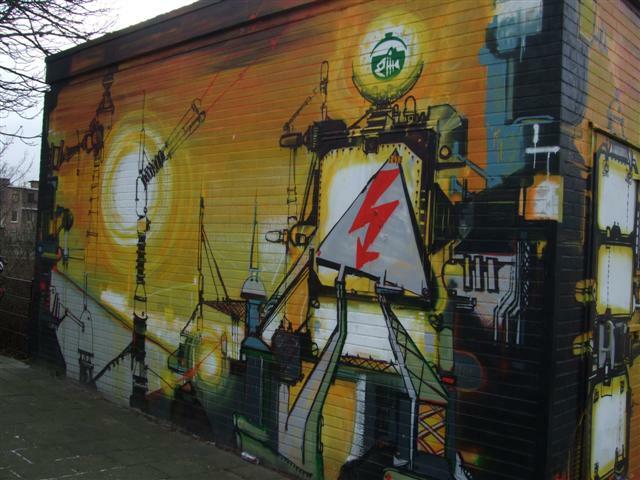 The other thing that needles me about this substation is the background pattern. 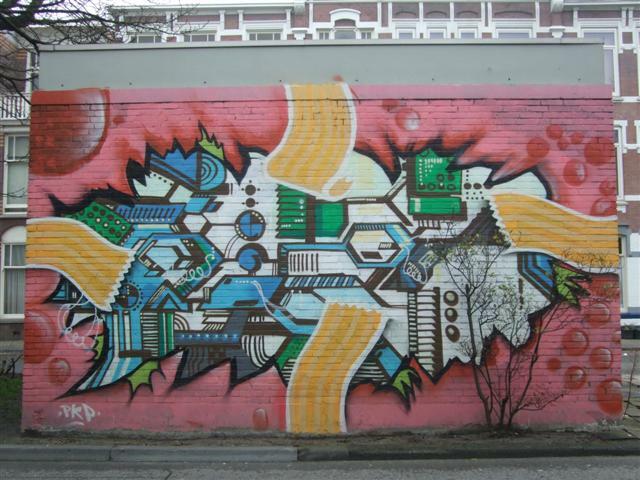 I’m VERY sure that it’s an abstract representation of the street map of the area, so I did a little Google-ing to try and confirm that. Annoyingly I could get some bits to fit, but not all of it… so maybe that theory is just born of cabin fever. Ah well, I was quite the amateur detective there for a moment, sleuthing out the clues and trying to put the pieces together. Turns out that my powers of detection are rather rubbish and I can now stop kidding myself that I’m the new Sherlock Holmes. Probably for the best you know… dunno if I could have gotten Himself interested in being Watson, but then again I think that Little Mr. might have obliged if I told him that the job went with a Police car complete with siren and blue lights. 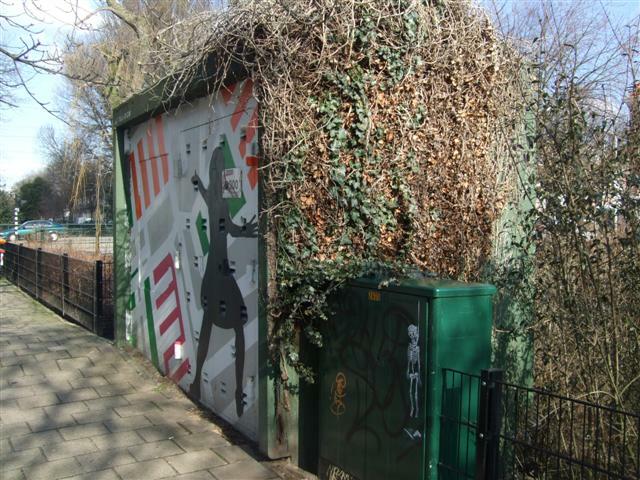 There are only two sides to photograph on this one, since one of the short sides and the back side facing the canal are both covered in ivy. I have done my best with the other two painted sides. It’s bold! It’s bright! It’s Electric! 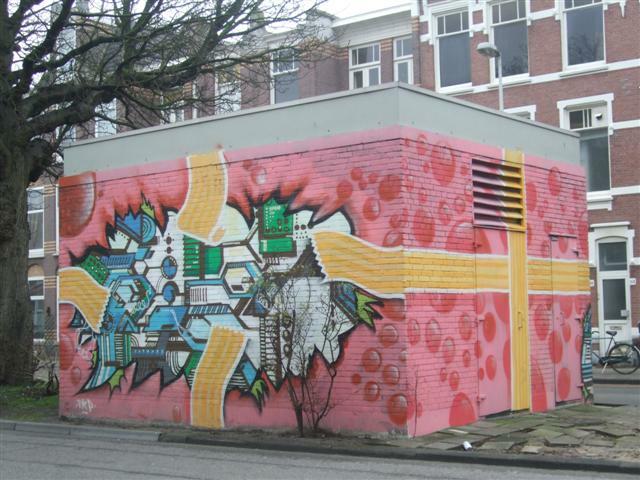 This Electricity Substation comes gift wrapped ? I’m sitting in bed, fairly immobile with my foot in plaster so new photos from around and about my home city are not happening any time soon. 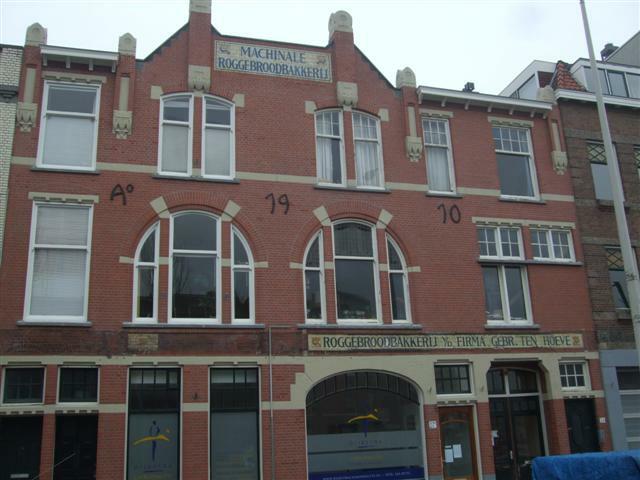 However I do have some photos in my stash from walking adventures around The Hague earlier on in the year, so this post is about a small series of those photos. 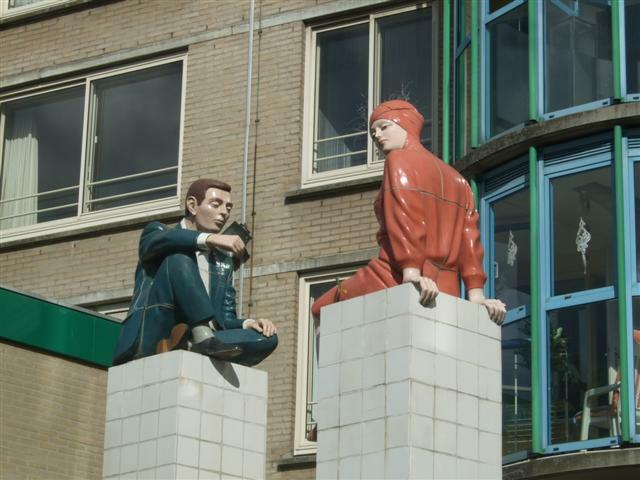 There are some figures in The Hague that many the locals will recognise but might be less well known to visitors. 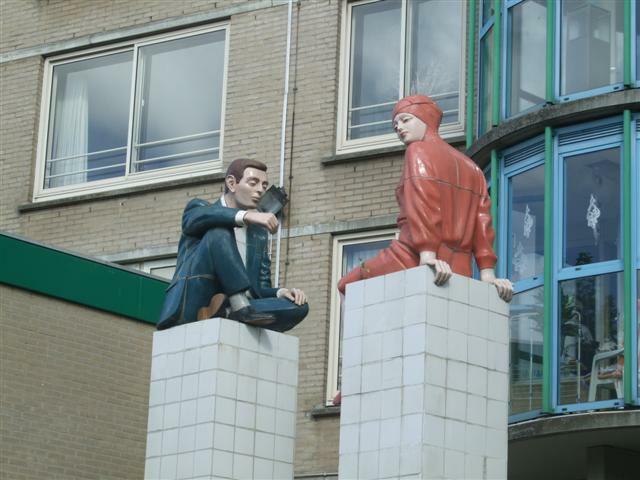 They are not situated in the centre of town or near any prominent tourist attraction, and are on a busy road, well above people’s eye-line and set back just a little so if you are just looking straight in front of you out of the car or tram window then you might not even realise that they are there. 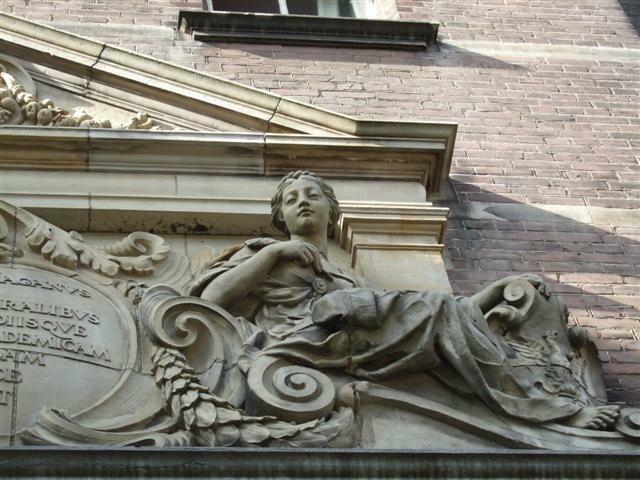 I’m a detail fanatic and love looking up at the decorations on old buildings when I’m a passenger in a car or on a tram. Sadly many of the oldest buildings on this street and in this neighbourhood were rather dilapidated and run down and so were in recent years demolished to make way for newer, more modern houses and shops. If you find yourself on the Loosduinseweg, between the intersections of the Asmanweg and the Gaslaan, heading towards Loosduinen, then you will have on your left hand side a tram track that runs though a narrow avenue of trees and which divides the road and the traffic heading in the opposite direction and on your right hand side, a large block of Flats that sport some small business premises out the front. 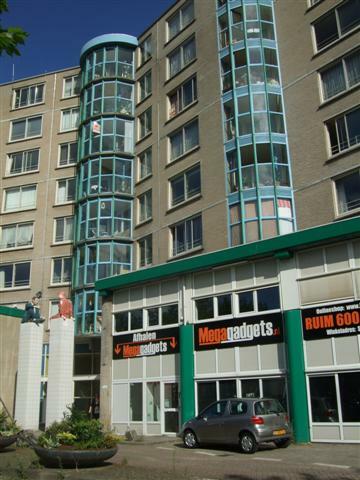 The Flats take up a good proportion of the area between the Asmanweg and the Gaslaan and more or less in the centre, there are two columns, that mark a small parking and drop off area that comes off the Loosduinseweg and service the flats. 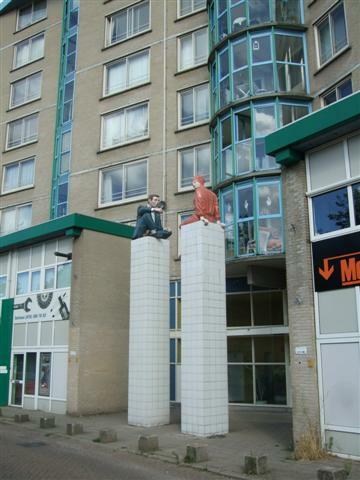 My statues are a jaunty couple seated upon these columns and if you are not looking for them, are dwarfed by the flats behind them. 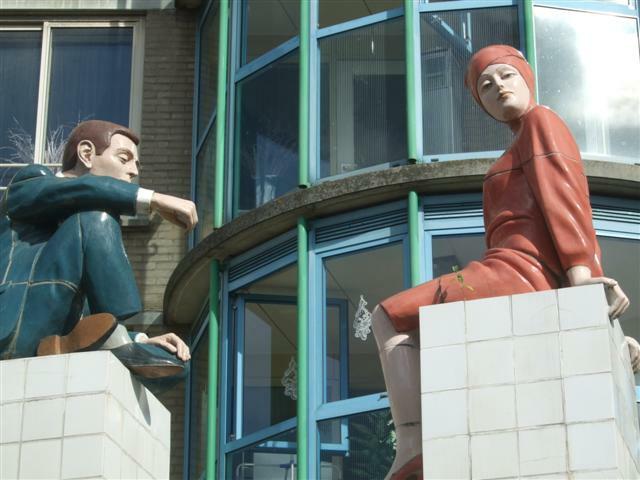 They are a figures of a man and a woman, 1930’s style (I think) and they are casually posed, nonchalantly looking down at the traffic that passes by on the busy road. Perched up high, it’s not so easy to get photos from different angles, but I’ve done my best. 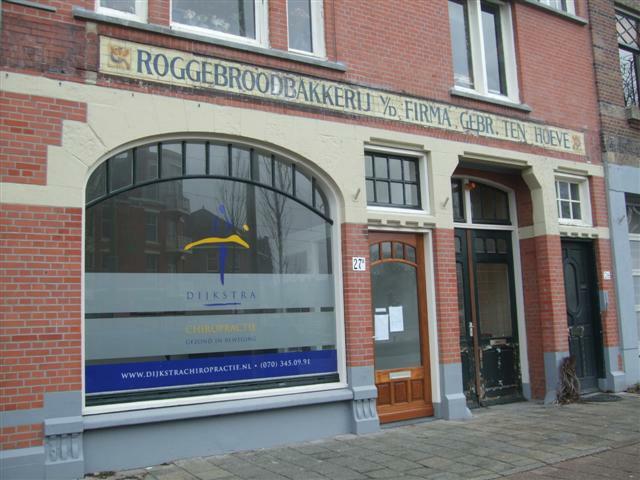 So what could a Chiropractor and a Baker possibly have in common? Kneading bread is hard work, but surely not that seriously bad? Well in this case the answer lies less in the occupations and more in the building that they both occupied at one time or another. If you at the kind of person who walks in a hurry with the sole aim of getting from A to B and everything passes by you in a blur, then maybe taking moment to look around will make your commute a more scenic experience. Naturally this is easier to do in places that have buildings with some history to start off with.. Europe has bucketloads of it so I’m very lucky indeed in this respect. 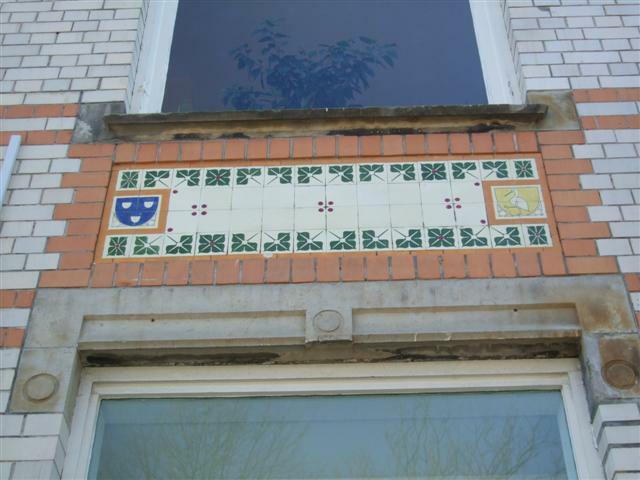 Most people, I notice completely forget to look upwards and have no clue that above their heads are beautiful decorative tiles, roof lines, iron and brick decoration. Maybe it’s the current obsession with the modern, maybe these people don’t find these styles aesthetically pleasing any more, thinking of them as the “old things equals old fashioned”. 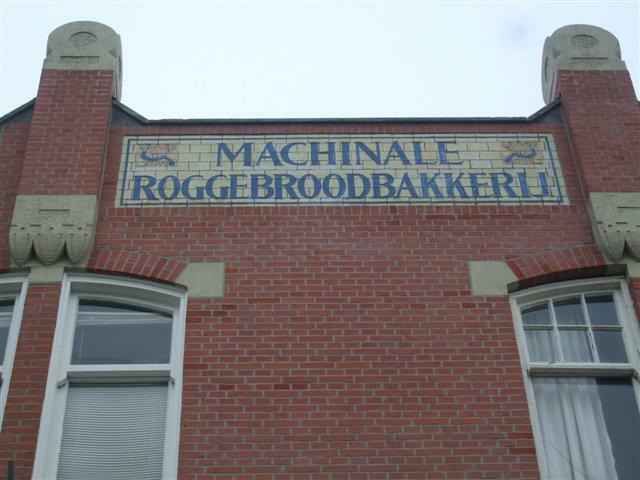 “Machineale Roggebroodbakkerij ” in this beautiful sign of old, means “Machine made Rye bread bakery”, Roggebrood being a very dense, dark brown, almost black bread. 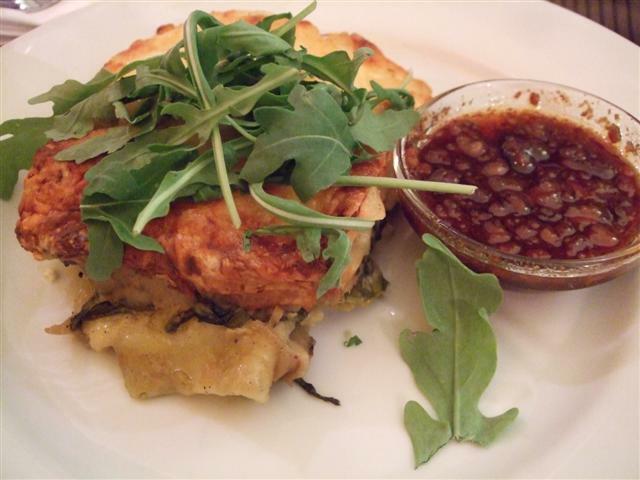 It’s later typically cut into ultra thin slices and paired with a heap other Dutch favourites such as Erwtensoep (the thick winter traditional pea and ham soup). These days the building houses a Chiropractor’s premises, but luckily the signs of old remain. 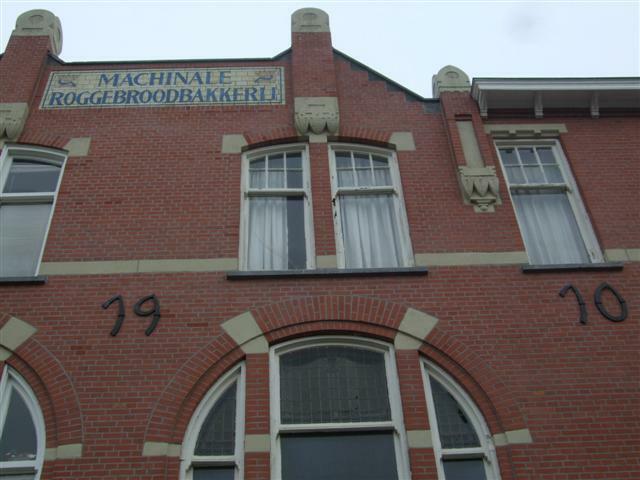 I love that not only the name of the company was incorporated (Roggebroodbakkerij v/d (van de) Firma Gebr Ten Hoeve, and the date above of 1910) literally translates as ” Rye Bread Bakery from the Firm/Company of Brothers Ten Hoeve”. 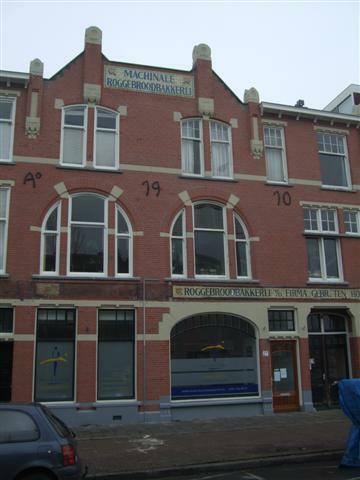 The Ten Hoeve being the family surname. Being a detail fanatic I also love the extra small detail of the three stalks of wheat/barley or rye, with a hand scythe wrapped neatly around it. Simple, elegant decorative and beautiful to the eye. 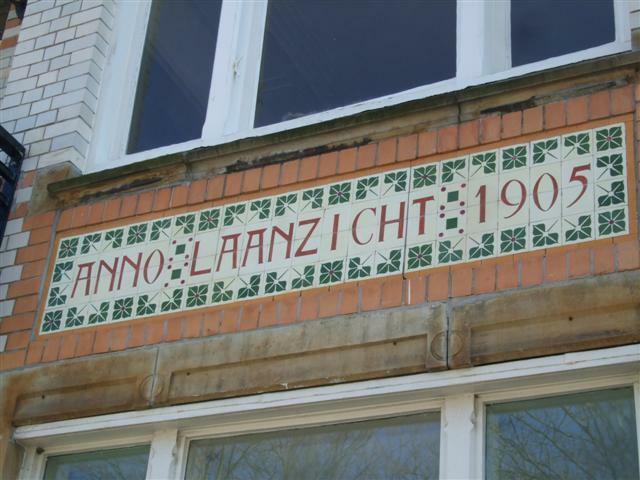 I look at this sign and wonder what life was like in 1910, what I would have seen had I been standing in this exact spot as these tiles were being fitted into place. 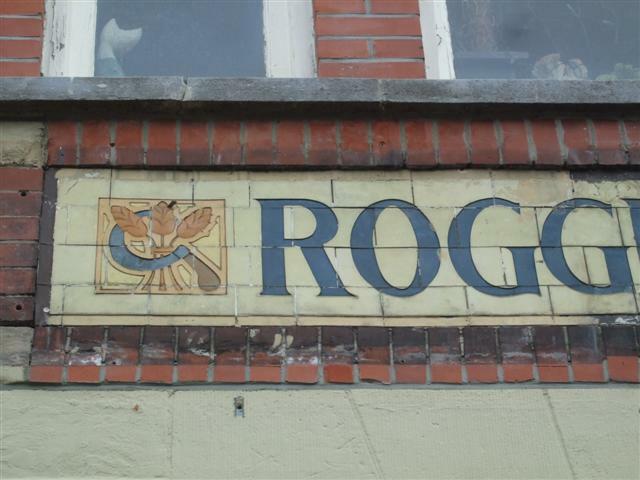 Definitely times have changed beyond recognition, especially for me as a woman, but luckily though, whilst the Roggebroodbakkerij that stood on this spot is long gone, Roggebrood in the Netherlands is still to be found in every bakery and supermarket and is still much loved. Sadly for me, I like a lighter rye bread very much but find that Roggebrood is a little too heavy and dense for my taste. So I’ll stick with oogling the signs instead. 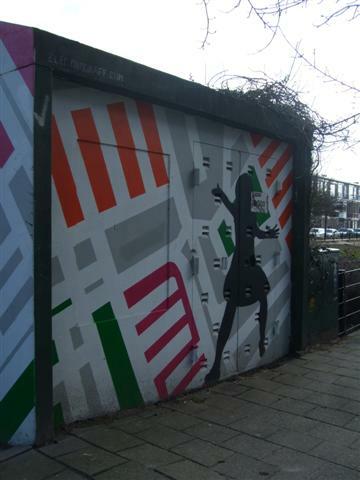 I’m adding again to my collection of decorated electricity substations that are situated in various parts of the Hague. 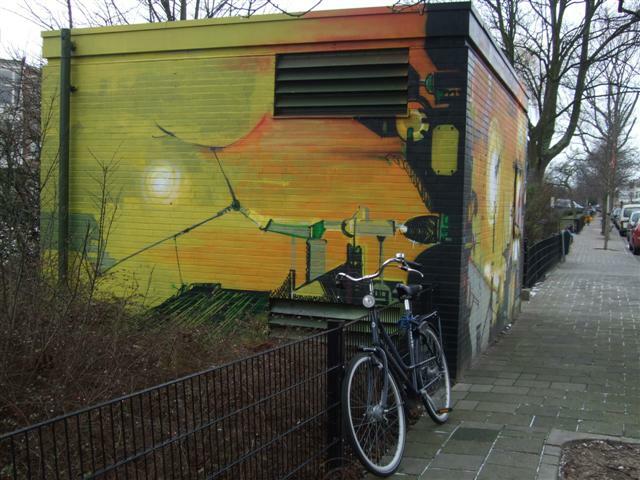 This next substation is located behind the petrol station at the junction where the Valkenboslaan , the Loosduinseweg and the Valkenboskade in Den Haag (The Hague), The Netherlands. I took these photos earlier in the year, in February when winter was still in force. 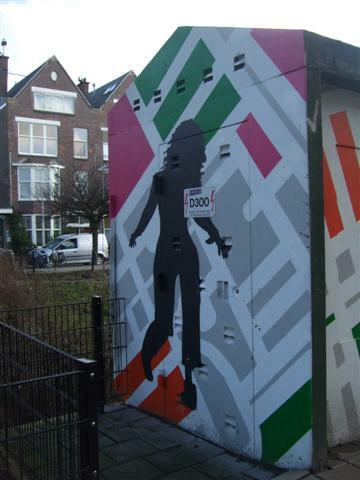 The box actually faces the water of the Valkenboskade (canal) so I could only therefore photograph three of the four sides. The images are intense and dramatic… I’m still making up my mind if I actually like this one or not. 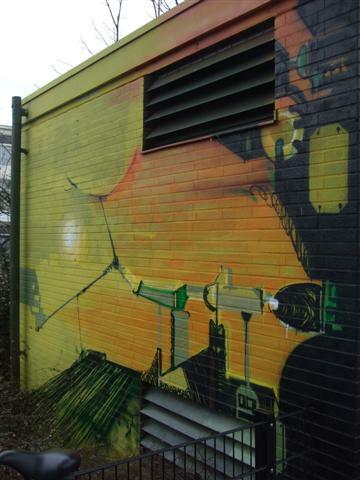 What I do like, is that sunshine or rain, this substation simply blazes colour and surely must put a smile on the dourest of faces. 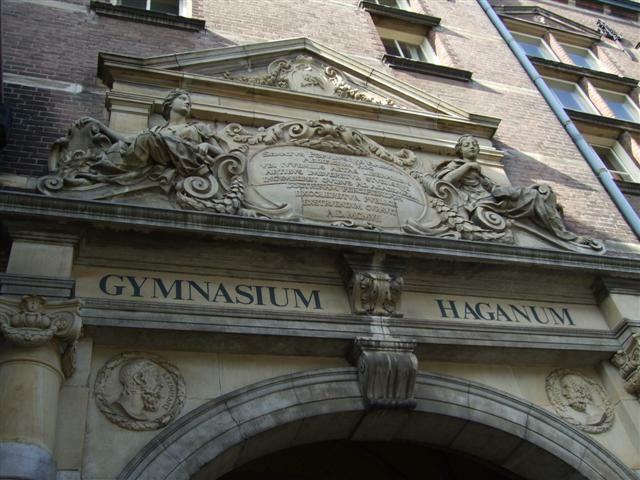 Het Gymnasium Haganum, when “Old School” means 1394! 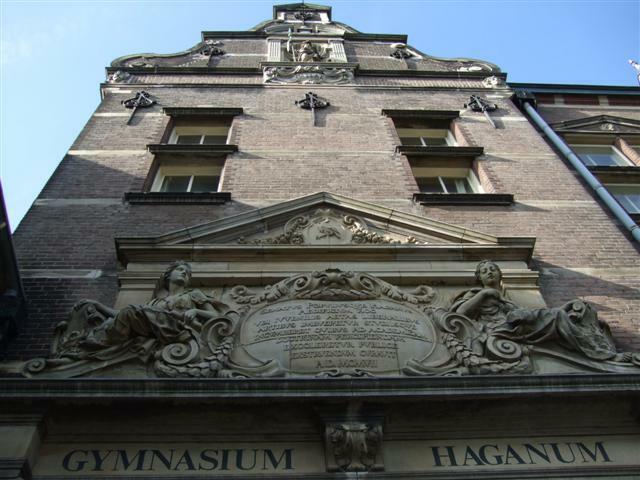 Het Gymnasium Haganum is a very well known landmark in The Hague. 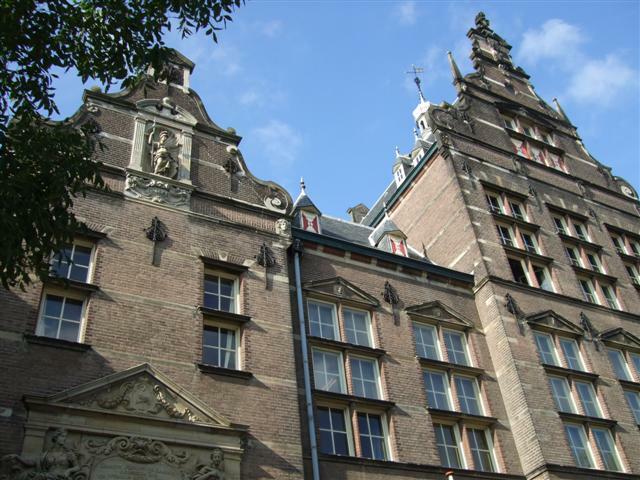 It’s one of the oldest public schools in the Netherlands and was founded in1394. 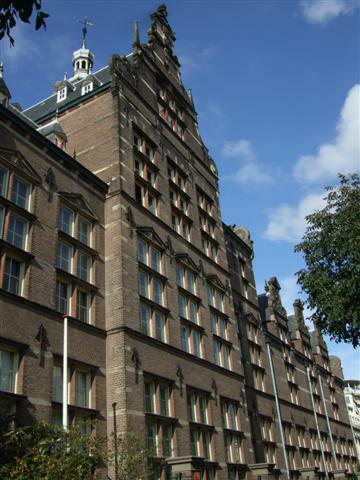 The building as it is known today is in the neoclassical style, built in 1907 and is located on the Laan van Meerdervoort. 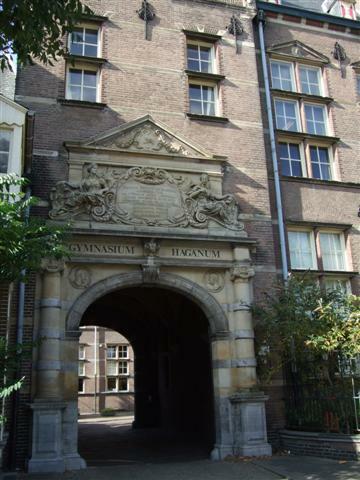 In 2005 the school had around 650 students. 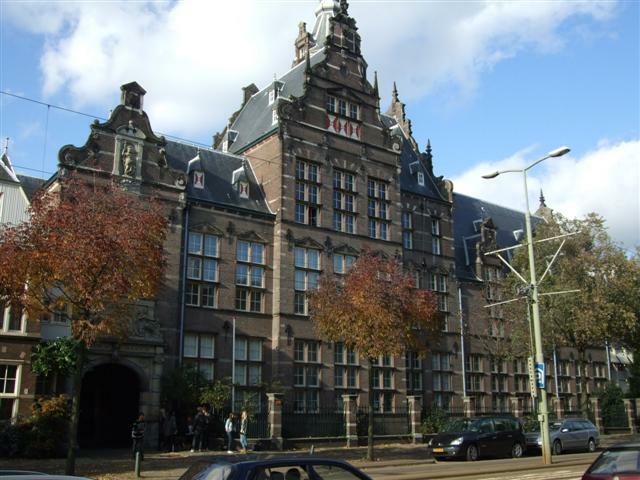 The school is one of the top schools in the country, according to a yearly survey by Dutch “Elsevier” magazine. 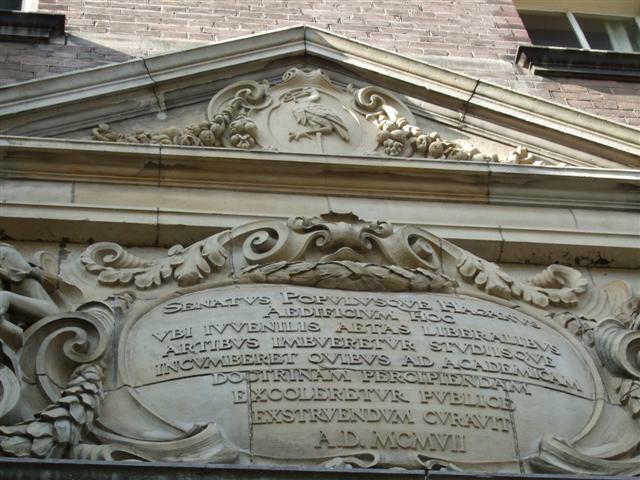 I’m less interested in the schools scholastic merits and more interested in it’s gorgeous architectural details. Everywhere I look there is one detail or another. I find myself wishing for a tall ladder or better, a small crane so that I can get up high enough to see it all. Not that I’m any good with heights, but I might be tempted to face my fear for the chance to drool over beautiful masonry, ironwork and tiles. (sigh) Maybe, had I been a man and lived in centuries previous I could have been a Stonemason. 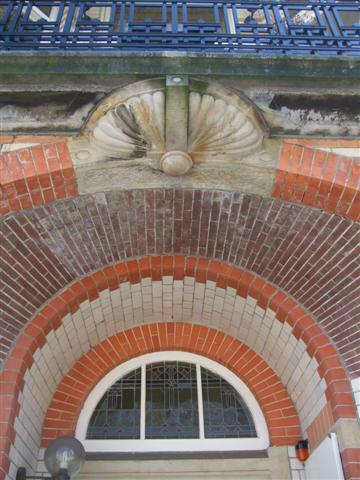 I love adore stone, carving and the smoothness of flowing chiseled forms. If I won the lottery big time, I could care less for a new, modern, stainless steel and glass mansion.Give me a character building with the baggage of History, crooked walls, doors that lean a little, old tiles, wooden window frames, shutters, deep window sills, window seats, and as much stone, brick and tile decoration as you could squeeze in with good taste. 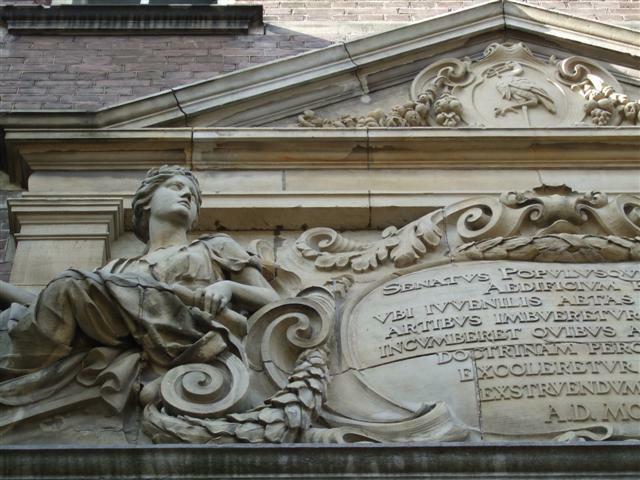 The mor you look, the more detail you see… scroll, leaves, Latin and cornices. 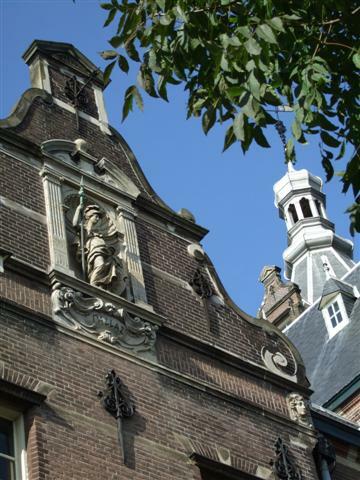 The dude with the spear sits high up in the facade by the roofline… the tower is just in view. 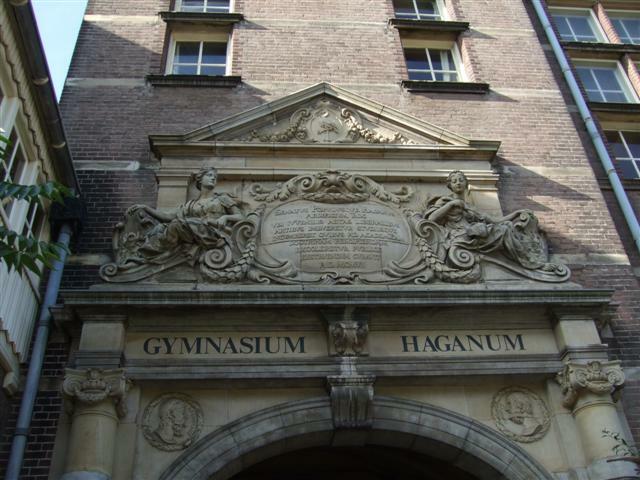 Portraits and laurel wreaths set around the archway. Is your Dentist this Beautiful? 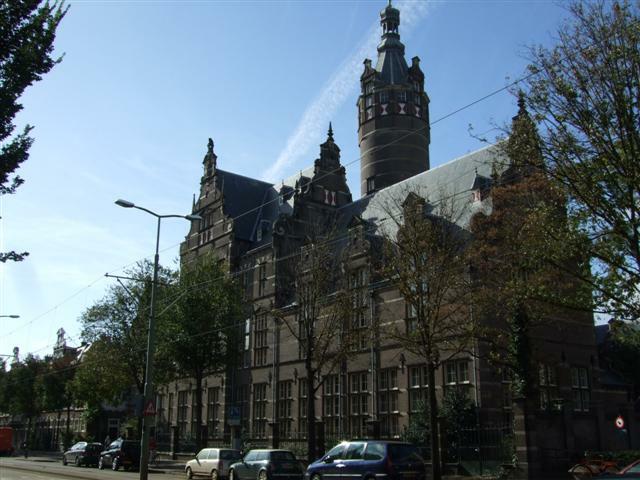 The Hague is full of beautiful buildings, in the older established neighbourhoods they are everywhere if you take a few minutes to look. 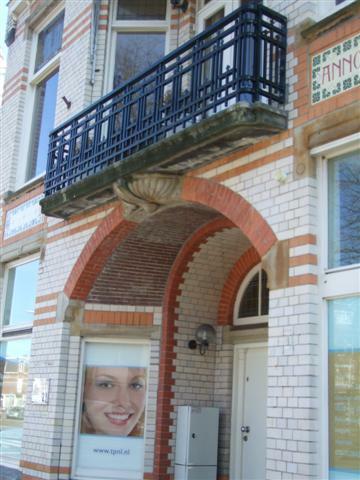 This building is currently a Dental practice. I have no idea if it was a business before or a private residence. If I had to guess, I”d say that it was built as a private residence because the decorative tile on one side contains a coat of armss on the left and the symbol of the stork on the right ( the stork being the sysmbol of The Hague) and surely they would have inserted a company or family business name in that space if it had been a building for commercial use? What a shame that is, not to mention a great loss for our grandchildren, great grandchildren and all future generations, what will be their view of the antique buildings of “our time” far on into the future? 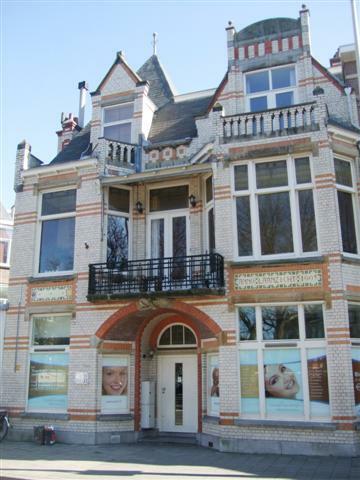 So, if you need a dentist, this might be a place to investigate, but if you just want a beautiful building to look at, it’s work a closer look. .. and just like looking after teeth… it’s detailed work…. 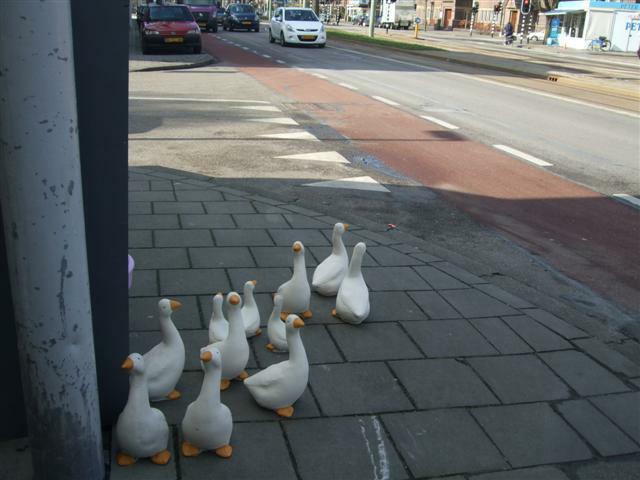 Did I see that right or am I going Quackers? I like the way that some small businesses try and make themselves more visible on big city main thoroughfares, to catch the eye of the passing public and to entice them to stop. 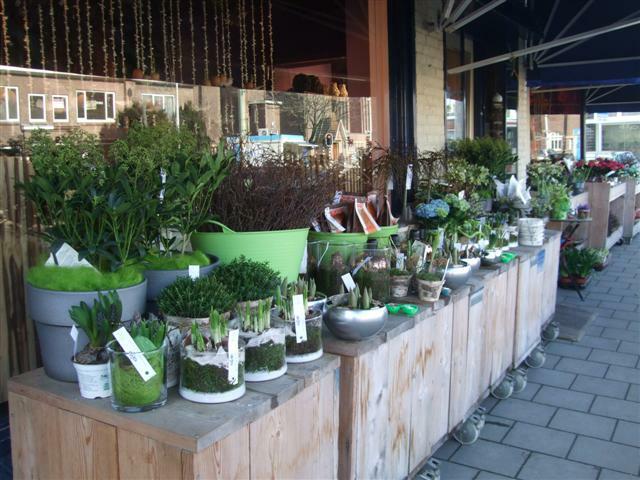 This shop on the Hague’s longest street, The Laan van Meerdervoort, certainly caught my eye as I passed by in the car. Later, on one of my walks I made sure I went past there so that I could grab some photos. 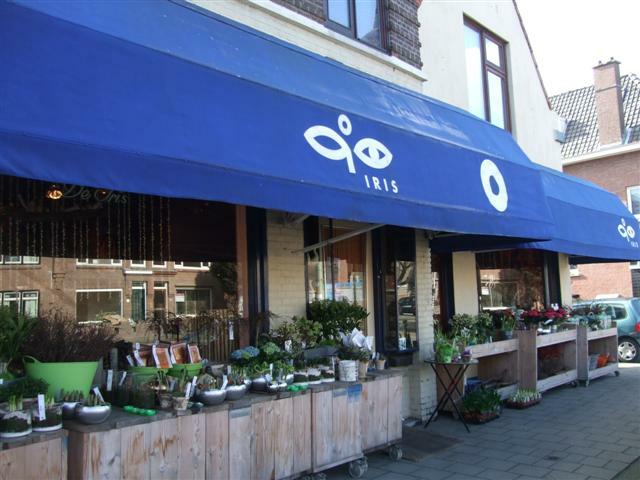 Rather poetically this Florist shop is located in the “Bloemenbuurt” which literally means the “Flower neighbourhood”, (where all the streets are named after flowers) and is on the corner of the Ribesstraat and Laan van Meerdervoort, almost opposite the Azaleaplein. I love their sense of humour and style… and they certainly caught both my eye and my camera lens, …wonderful! I also like the fact they have use not only the shop window but also pavement to display their wares. 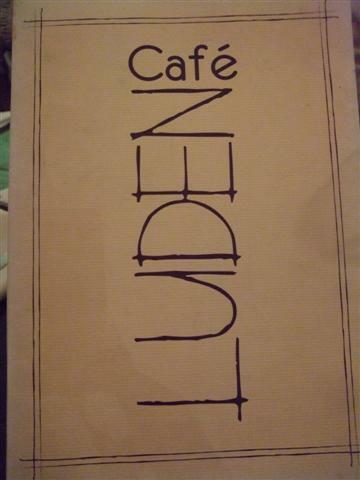 Restaurant Review: Cafe Luden, the Plein, The Hague. Sometimes the parents of our children’s class get together for an evening event… we’ve had very successful Pot Luck, and then it was decided that the Mama’s should have a Ladies Night out, so 8-9 of us met up at Cafe Luden on the Plein, in the centre of the Hague. 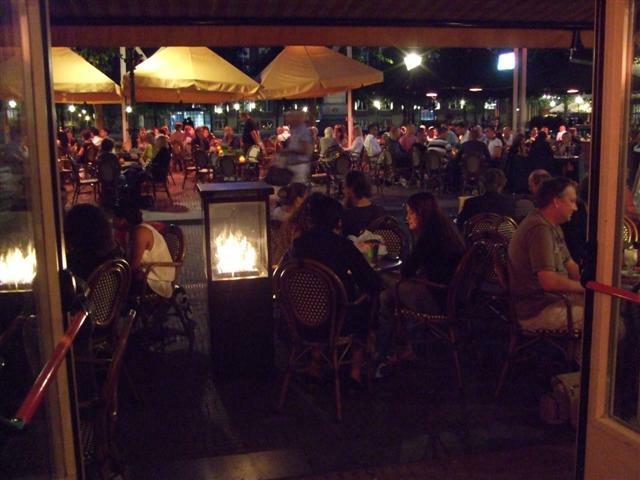 The terrace outside the Cafe was very crowded, and we arrived for a later dinner so elected to sit inside, right at the back because it was clear that even though it is summer, that the evening was going to cool off considerably once the sun disappeared. 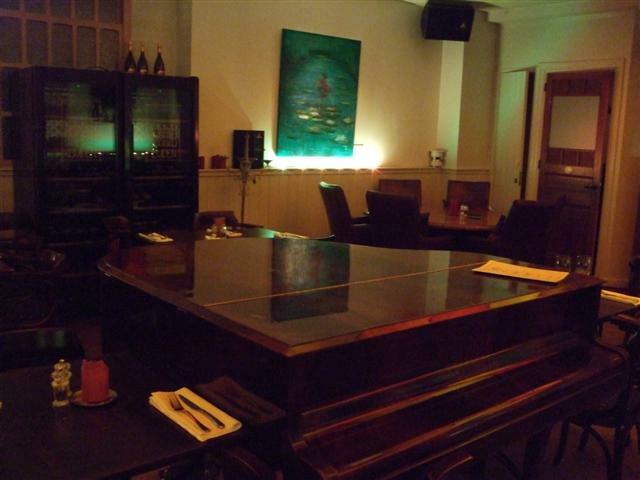 We consequently had the rear of the restaurant to ourselves, had no problems to put several tables together so that we could all be seated together and proceded to order. The menu is only in Dutch, but I’m sure that if you don’t speak the language and ask for help / advice that they will be happy to give you a run-down of the menu in English. I have food allergies and our waiter was friendly and helpful when it came to checking the menu with the the kitchen for allergy hazards. 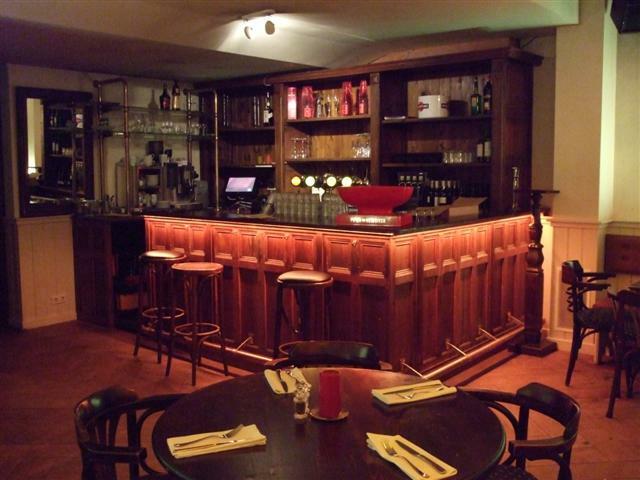 One thing you need to know about Dutch restaurants when dining with a group, is that they won’t make separate bills, or separate the orders on the bills, it’s up to the customer to do the calculations and to split the bill themselves afterwards. This is standard practice and it doesn’t even matter if five whole families are eating together for a family event, the total of all the food and beverages will be presented on one bill. I’ve worked as a waitress before and don’t see why this couldn’t be part of the service, but no matter how much you ask, or where in the country you ask it, the answer is invariably “Sorry, Not possible” so pack a pocket calculator or at least a pen in your bag or wallet so that you can do the maths, especially if it’s a very large group. Sitting at the back of the restaurant poses low light problems for the camera so I did my best on the shutter front, so that at least you will have an idea of what the menu is like. 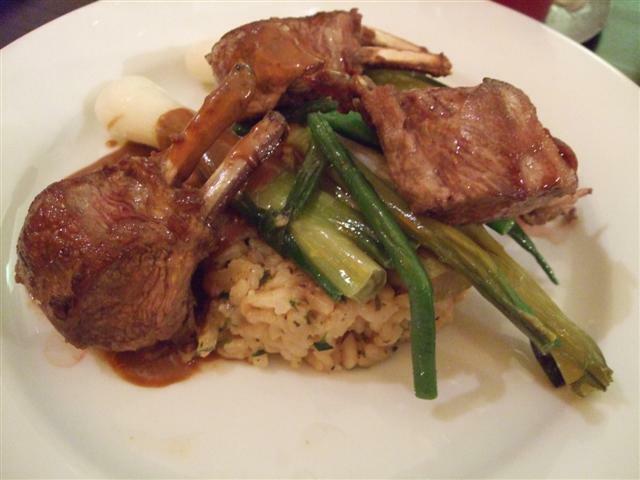 Lambchops with honey/mustard sauce, confit of green asparagus with spring onions combined with a risotto of fresh herbs. 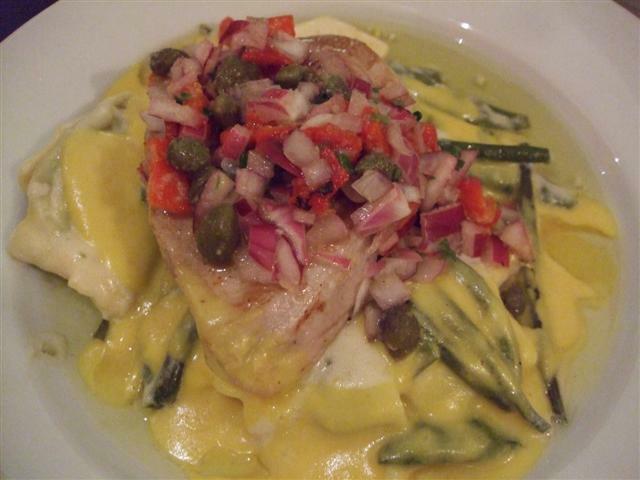 Tuna fillet, with Antibois (which means literally “from the Antibes”) of paprika, red onion, garlic and capers, pasta and sundried tomatoes. 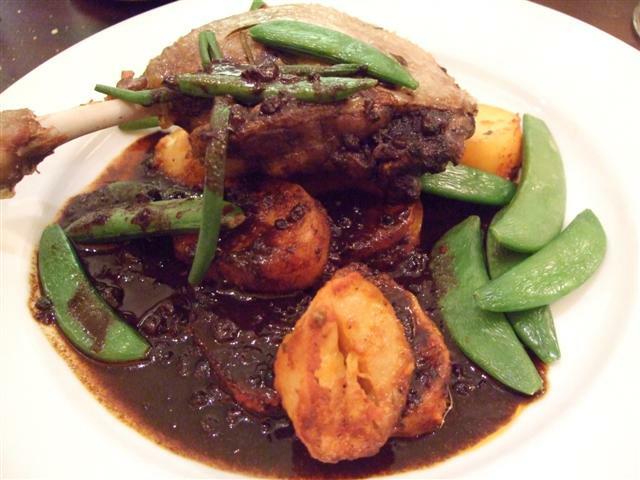 Confit duck, with American potatoes, green Spring vegetables and gravy of red wine and fruit. 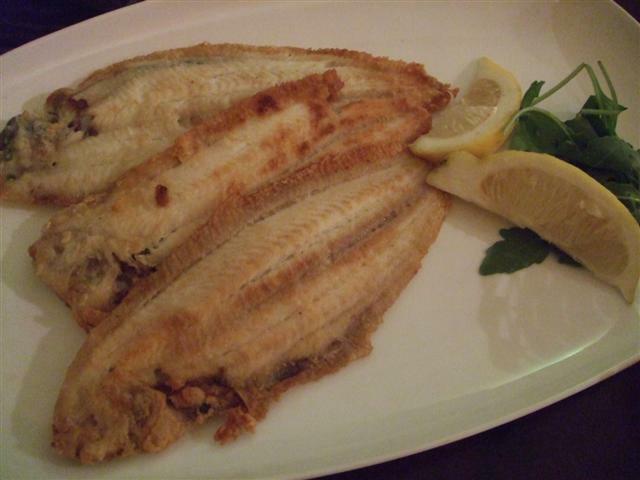 Slibtong (I think that might be a relation of a Sole fillet) baked in butter, served with fries and salad. 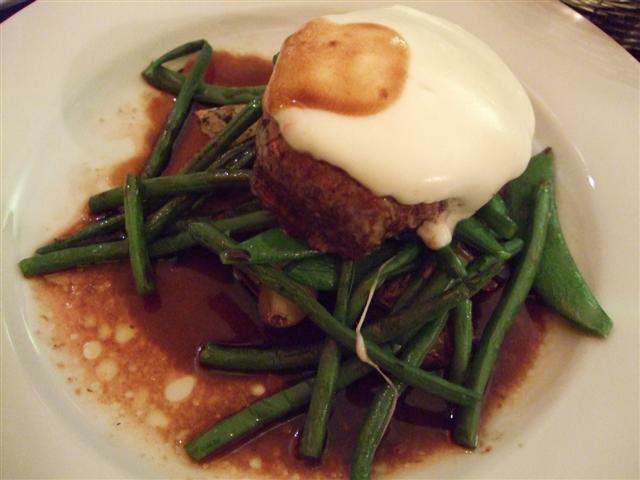 Tournedos (pronounced “torn -aah-dose”) with a gratin of mozzarella and balsamic gravy, green vegetable mix, and roasted Roseval potatoes. 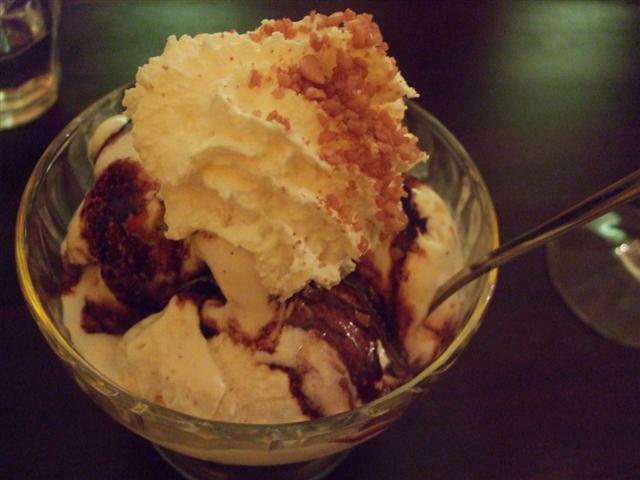 Dame Blanche (literally means “white lady” and not “dumb blonde” as one colleague thought in a funny conversation about language blunders years ago) … basically it’s vanilla ice-cream with chocolate sauce and cream… and probably on every restaurant menu in the Netherlands. 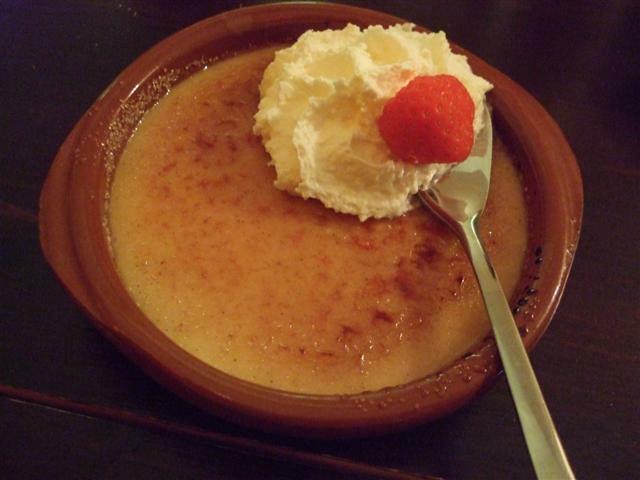 My personal favourite: Crème Brûlée (literally means ” burnt cream”).. actually it’s a creamy vanilla custard baked, a layer of sugar is added at the end which is then flambéed or caramelized in the oven or with a blowtorch. I did ask everyone to rate their meal so that I could share their opinions here. 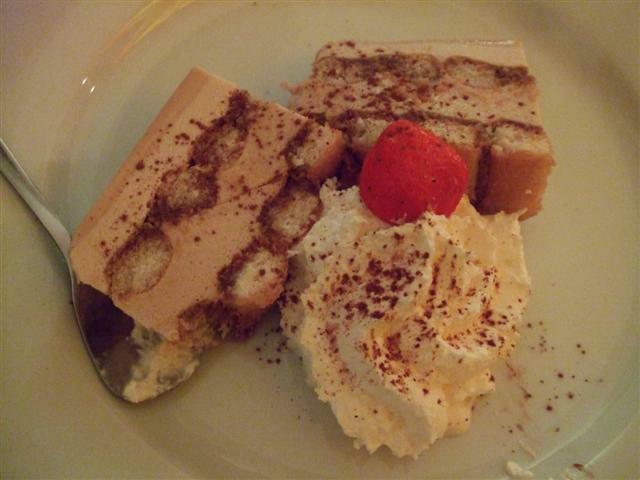 Sadly although the presentation was well recieved the actual food rated less well. “ Just OK” being the general consensus. Reasons why? Here’s the lowdown: the Tuna Fillet, the outside of the fillet was wonderful, great texture and taste, more of this Please… but the center was pretty raw and inedible. My Confit Duck: I’ve made this at home and to be honest it turns out far better than what I was served here. Confit is a long slow cooking method, very long, very slow, and the meat should be silky soft and just fall away from the bone at the slightest touch. This effort was cooked though, but I literally had to scrape and tug it off the bones bit by bit. It took force, and I mean where the thought runs though your head” ” I hope this doesn’t fly off the plate and hit someone” kind of force. 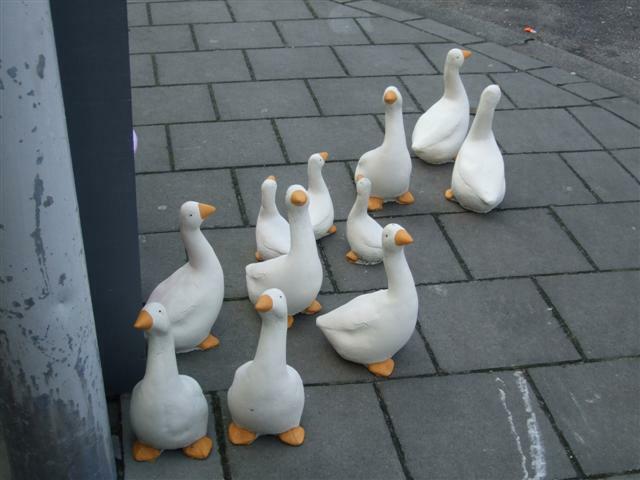 Whatever kind of Duck this was meant to be, it doesn’t scream “Confit” to me. Other opinions were that the food was about a ” 5 or 6 out of 10” . I was disappointed that the friendly waiter (clearly more occupied with Front of House and outside guests) didn’t come back to ask how our meal was. I would have said something if he had… others in our party might have too. 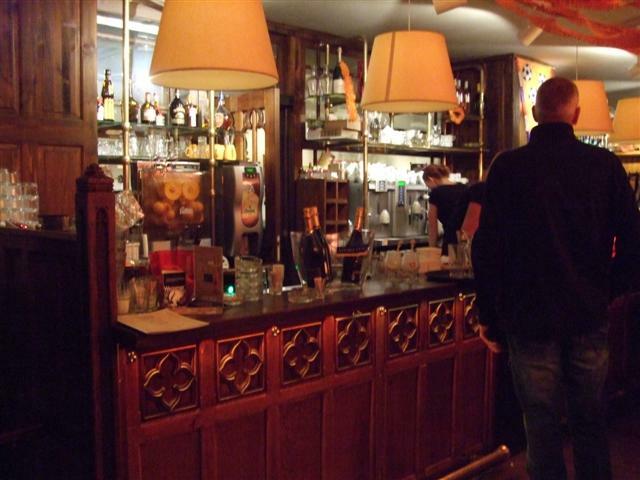 Positive notes were that the waiter was friendly so at least we didn’t have surly service on top of a mediocre meal… and the price was reasonable enough, I paid Euro 35,- for my Confit Duck, Crème Brûlée , two Cola Light’s (and my part of the tip for the service). I was also disappointed because this establishment was chosen for our night out because we had heard it had great food. Something didn’t tally up tonight if that is usually the case. Signs of the Times … slowly fading away. 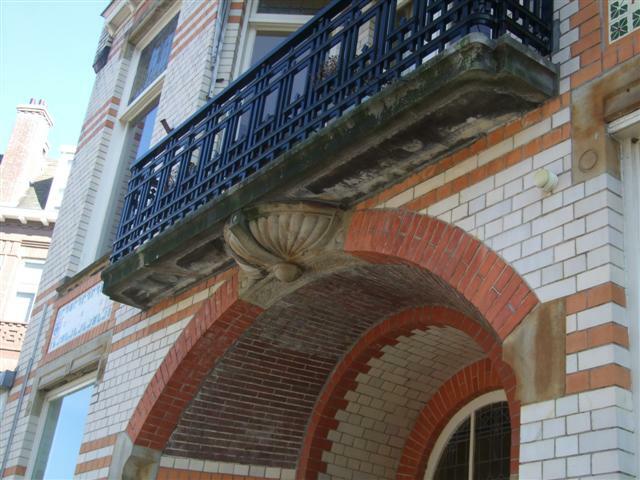 I’m interested in old buildings, architecture, the history of places. 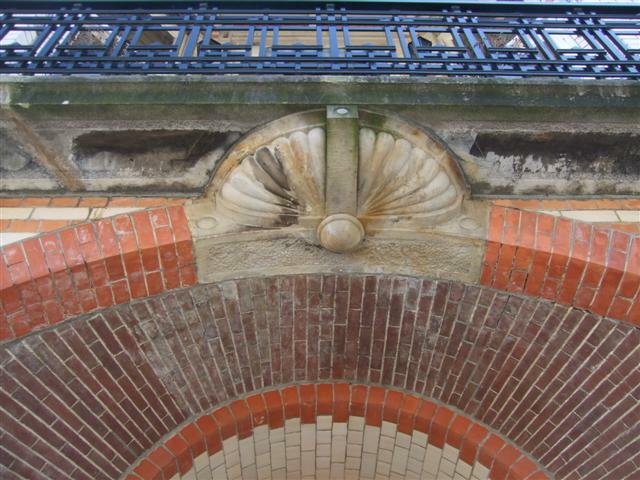 It’s wonderful to see how buildings evolve in style and function, how they change with the times (or don’t). I particularly like old advertising… and chanced upon this one whilst out on a walk one day. 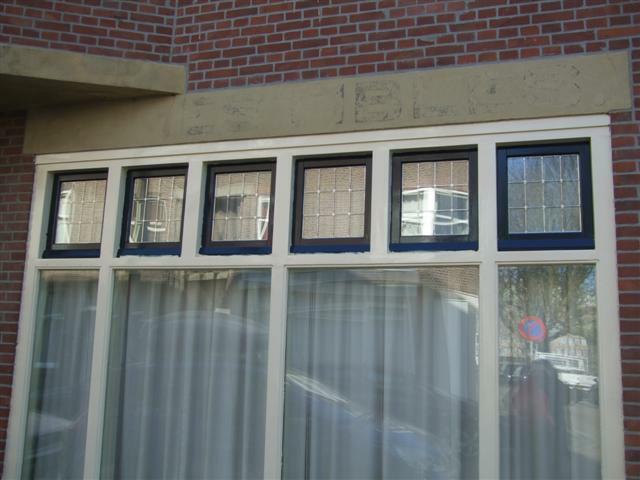 The unexpected thing about this one is that I found it on what looks like an ordinary house, in an ordinary street full of houses, and not in a shopping street as I might have expected. There are two signs, a long one and a short one. 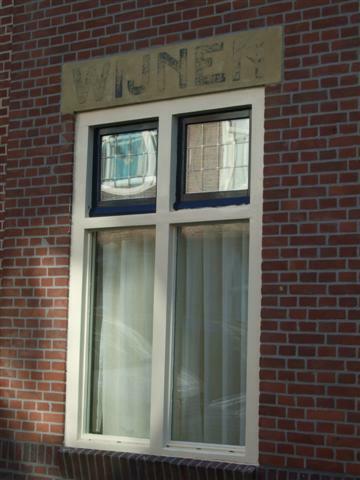 The short sign is easy enough: “wijnen” means “wines”, but the longer sign has deteriorated to the point where it is no longer legible. I’ve tried guessing, but there are too many possibilities and combinations to be able to make sense of it at all. I wonder when this was a business, when, for how long and why it stopped being one. One thing is clear: businesses going out of business (for whatever reason) are nothing new… it’s being going on for decades, centuries and probably millennia. Lack of heirs to take over the business? lack of customers? fell on hard times? or suffered ill health? or maybe the owners went on to better or different things? … or simply moved somewhere else. Who knows? It’s all part of the mystery. The mystery remains, and will do so until the final letters slowly fade away entirely. Then no one will even know that a mystery had even existed…. 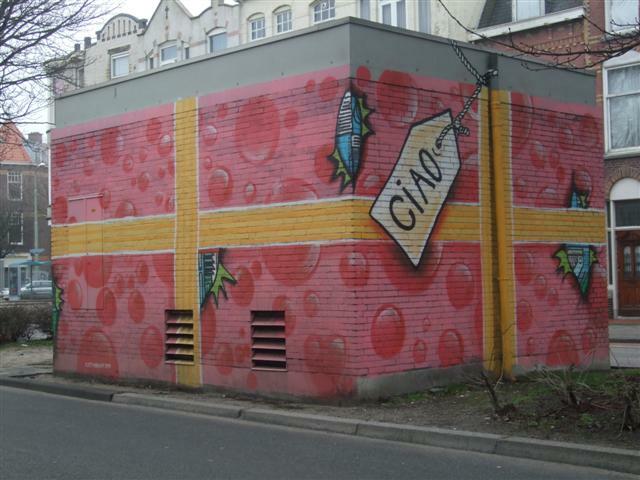 This Electricity Sub-station comes gift wrapped ? 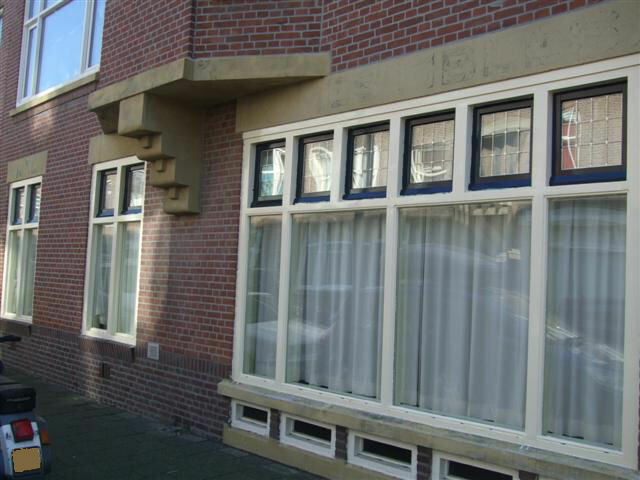 Here in The Hague, I like to wander around and take photos of local places, sights and things I think are of architectural or social interest. 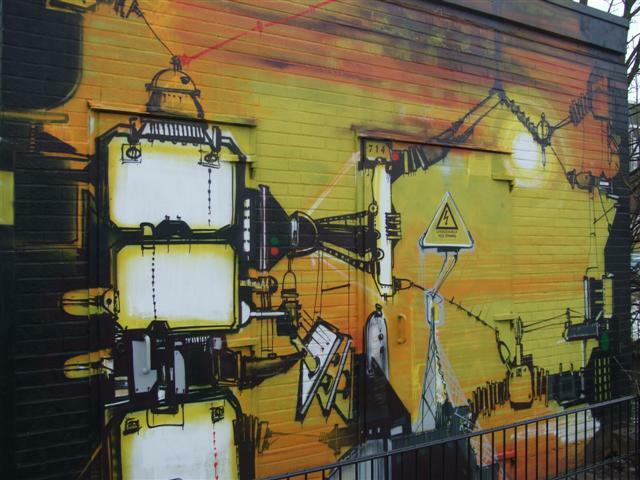 One item has consistently caught my eye and attracted the attention of my camera lens: Electricity Substations in various parts of the city have been painted up by artists in a multitude of styles. 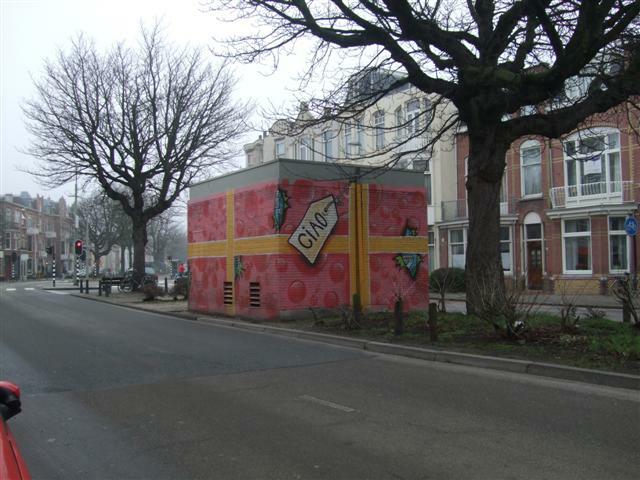 I love them because I believe that any effort to brighten and make a colourful and positive city landscape should be encouraged and applauded. I have been taking photographs of them at any opportunity and have a small series on the blog about the ones I have found so far. This sub-station is on the Vulkenboslaan close to Edisonstraat and I took the photos at the very beginning of Spring which I think was a good moment because the trees are obscuring it’s full glory a little now that they are in full summer leaf.